It sure has felt like Antarctica at school this week! As intermediate readers move into more complex, dense informational texts, they need to make more and more inferences. Talking about these inferences and the thinking behind them is essential. I created a new text with embedded questions to help readers get to this level of inferencing. Embedded questions are great for helping readers to notice key details in texts. The text is chunked so that it looks less intimidating, and readers know where they will find the clues they need to devise answers. Visualizing is a kind of inference! After all, authors never explain all of their details in a description. 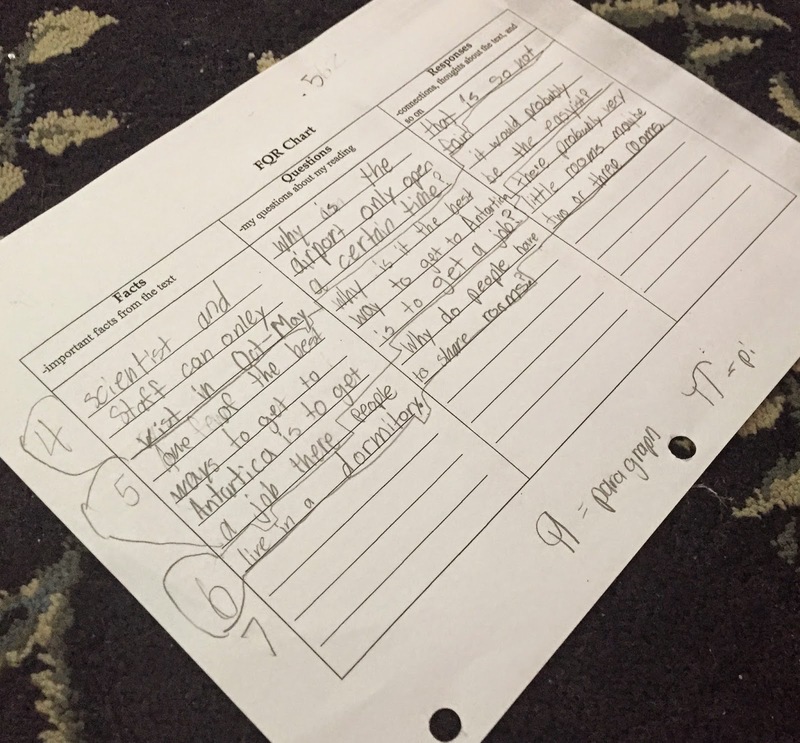 Authors depend on readers to fill in critical details from their own prior knowledge. In turn, those details help readers to fill in other gaps in a text. Consider the text at the right. How did people try to find a southern land mass? The word "sailors" is a key here. Read the text aloud with students. Ask students, "Can you find the sentence that helps you to visualize how people tried to find a southern land mass?" Some will be able to; others may be confused by the mention of Greeks at the beginning of the passage. Think aloud: If sailors tried to find Antarctica, what would they be using? Ships! Would they have modern ships? Why or why not? Students may recognize The Age of Exploration as a clue to the time period, or they may not. This led to such interesting questions and comments from students. Some students didn't recognize that "southern land mass" refers to Antarctica. Others started wondering--why didn't the sailors steer around the icebergs? Why was the sea ice such a problem? I followed up with a video from my Antarctica playlist to answer their questions at the end of class. Pronoun/antecedent inferences are essential to understanding expository text. Often, students have trouble tracking these, especially when the pronoun is in a different sentence from the antecedent. In this example, we marked the text with arrows to show the relationship between the pronoun and the antecedent. This helped to prepare students for the inference question: What is the name of one of the three research stations? If this seems remarkably easy, I assure you that it is not simple for many struggling readers, especially ELLs. We had to discuss whether the station would be "Nathaniel Station" or "Palmer Station", and why! Making inferences helps readers to put the pieces of a text together. These kinds of inferences need to be explicitly taught and discussed. To make your own embedded questions, take a look at some informational text that you are sharing with students. Cut it apart and add inference questions--visualizing, pronoun/antecedent, text-based inferences, and reader-based inferences. How do your readers respond? For more on kinds of inferences, you can see Chapter 4-7 of my book, The Forest AND the Trees: Helping Readers to Use Details in Texts and Tests. Looking for more texts to compare? I just finished Spring Paired Passages, which includes texts about weather sayings and tulips. Great for test prep, but with interesting enrichment and extension possibilities as well! Helping readers to make inferences in nonfiction can be tough. For narrative texts, inferences about character emotions and traits are easy to see. In expository texts, however, the inferences often operate under the surface. Skilled readers may not realize they are making inferences, while less skilled readers may not even realize that an inference is called for. To help readers make inferences, I have found that questions are essential. Helping readers to ask questions of a text "wakes up" the inferring process. No questions = no inferences. -Best of all, slow down as they read! For me, teaching the FQR chart really helps me to see what readers are thinking. I have adapted this chart a bit in recent years. Numbering paragraphs helps us to navigate through the text and share our thinking easily. I also encourage students to put lines under their responses to keep thoughts from each paragraph organized. The FQR chart is especially beneficial if you have a large class. Teaching 30 readers at once is challenging. When we work on the FQR chart, I can quickly "clipboard cruise" to note who is doing well and who needs some more support. For example, the student who has filled up the entire "Facts" column but has no questions or responses will need some coaching, as will the student who falls back on a question formula. How does this lead to inferring? After reading a paragraph, we talk about the students' questions and how they can be answered with an inference. In the "Welcome to Antarctica" text, students read that the airport in Antarctica is only open from October to May. This made them wonder--why? 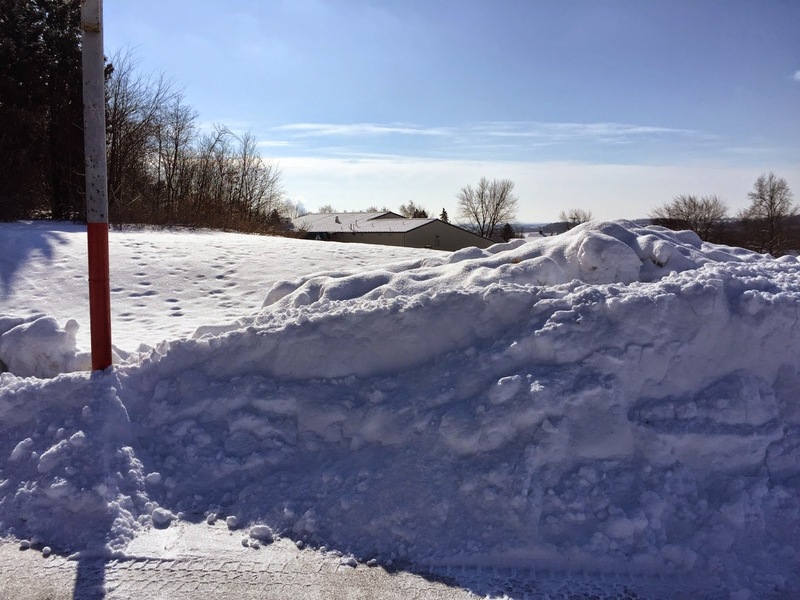 Using background information from the "Happy Australia Day" article that they read, students inferred that Antarctica's seasons must follow the same pattern as Australia's--and that the months from October to May are the warmer months. Not all inferences are as ambitious as this. One student read the sentence, "The Southern Ocean is rough and choppy, and many people get seasick." This student asked the question Why do people get seasick? I could tell that this reader hadn't connected information from the first part of the sentence with information from the second part. With some coaching, he was able to make this inference and write it in the Response column. I like to use texts that present new information to students for this activity. Last week, I used "Welcome to Antarctica", which is a text that I wrote as part of our Antarctica unit. You can find the text below. Helping readers to make inferences in nonfiction can be a challenge. Starting out with questions makes the challenge easier! This week, I found that I could build visual skills, questioning, and inferring even with a very traditional topic/main idea activity. As you can see from these paragraphs, right now we are looking at topics and main ideas. These are not the same at the all. Topics are best expressed in just a few words. Main ideas express a main point about a topic, and are always in complete sentences. Readers need to see lots of different paragraph examples, with main ideas in different places. Looking at multiple paragraphs with related topics helps students to see how topics and main ideas can be expressed in different ways. In these paragraphs, students also saw how paragraphs can have a sentence that doesn't belong. Okay, this is all the basic stuff. Kids really do need to have these experiences with paragraphs, and they are meaningful. 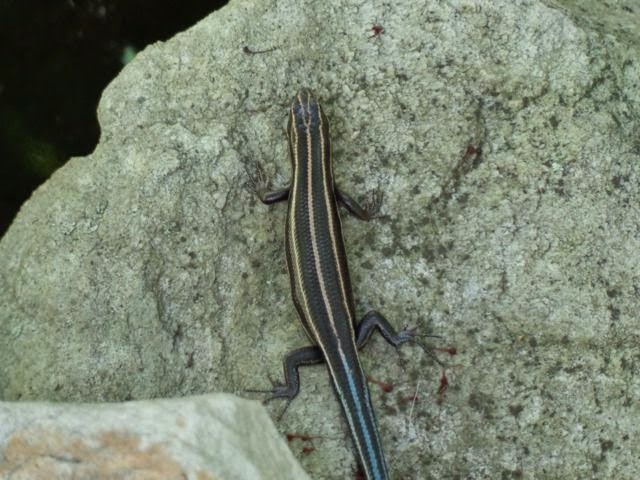 But the lesson didn't really get exciting until I started showing some skink photos from my personal archive. "Look carefully at this photograph. 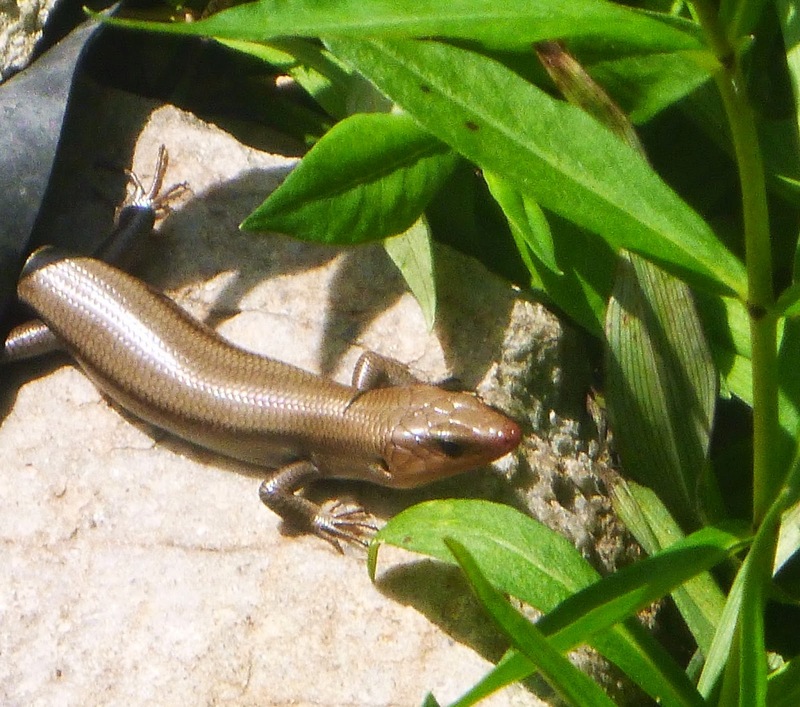 Based on evidence from the text, what inference can you make about this skink?" I asked students. I didn't have to beg or cajole them to look back--they were flipping through their pages, scanning the sentences, eagerly searching for the detail that they remembered. "It must be a young skink!" one student said. "Look, it says here in the text..."
Oh, the explicit text reference--that's totally what I want to see and hear! 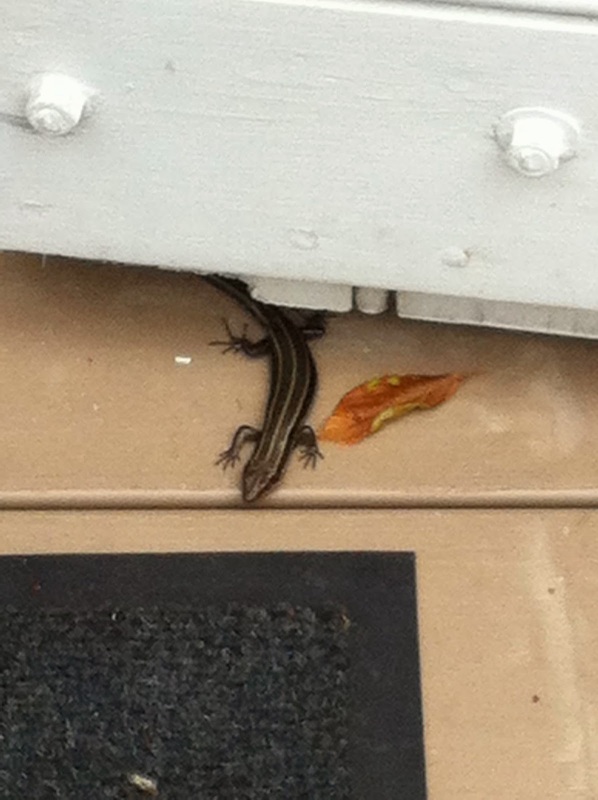 In the next picture, students first had to use some clues to figure out if the skink was on a wall or on the ground. "As you can clearly see, this is a floor mat," one student said--he definitely has a future as a prosecutor! It all shows how a simple lesson about main ideas and topics can become so much more! You can easily do this with your own paragraphs and photos. Why not try some paragraphs about your school? Consider the animals that are popular in your classroom right now--or a question that came up in science class. The skink texts are available as part of this product. I'm excited to be presenting at PETE & C today! My weekdays usually consist of planning lessons, managing papers, listening to 15 stories at once*, watching birds, and resetting Wifi, so it's exciting to be at such a large and glittering conference. 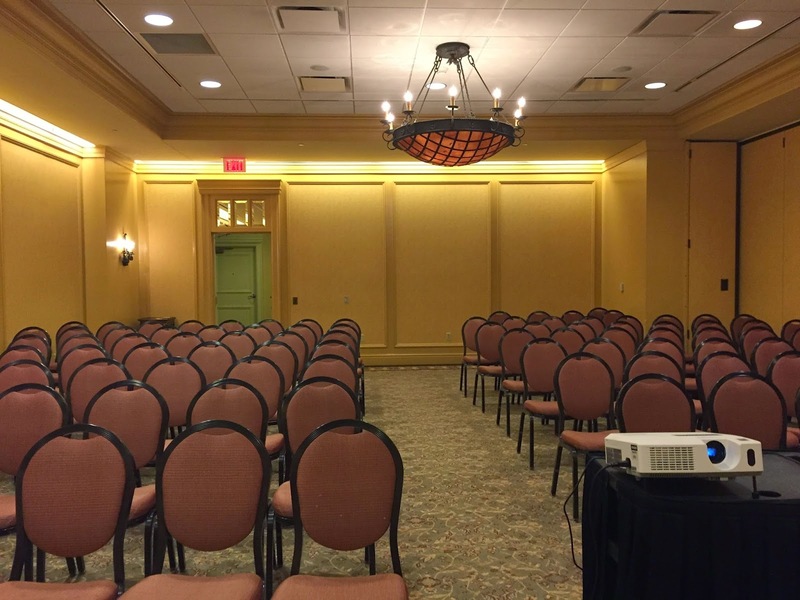 Look at the awesome room! My presentation focuses on looking at digital AND traditional text. So much of the conversation lately has been exploring the rise of digital text and kids' expertise (or lack thereof) with it. In my classroom, though, I've discovered something interesting--kids don't learn best from either digital or traditional text, but from both. *15 is an exaggeration. The most I have achieved is three. Three students, talking simultaneously, each telling a story, and I could understand them all! As my teen says, it's like I have superpowers, but they're not very useful. Why is it that the same kids who love to read and follow procedural texts struggle with questions about procedural text on standardized tests? As it happens, readers read differently depending on their purpose. A study of skilled readers found that reading directions with a goal of performance leads to better outcomes than reading directions with a goal of answering questions (Geiger and Millis, 2004). Let me say that again--readers show better comprehension when they read directions with the goal of actually doing them, not just answering questions about them. Well, of course they do! Reading with the goal of just answering questions isn't kid's idea of a good time. Sadly, of course, their reading comprehension (and our skill as teachers) is measured by students' ability to answer questions. Here are some things that we can do to beat the odds and help readers succeed with both answering questions and performing tasks. Helping students to read procedural texts goes beyond just assembling items in the classroom. Because our students will need to be able to answer questions about procedural texts, we have to help readers to go more deeply into the texts to answer questions. Geiger, John, and Millis, Keith. 2004. “Assessing the Impact of Reading Goals and Text Structures on Comprehension.” Reading Psychology 25 93-110. *Okay, the study gets even more interesting. When readers had to read to perform tasks, they actually showed the best comprehension with the narrative style directions--totally the opposite of the way that most directions are written! This sounds weird, but actually makes sense when you consider research that texts with low cohesion and out-of-order ideas actually seem to improve learning for skilled readers. You can find the fairy bread text here.